Situated about 6 miles from Munich International Airport, Marriott Munich Airport Hotel features business facilities as well as a fitness centre for guests to workout. Each room features a flat screen TV and alarm clock, while high quality beds ensure a good nights rest. A writing desk is provided, while free toiletries and fresh towels are featured in the en suite bathroom. Marriott Munich Airport Hotel features a shuttle service to and from the airport, while free Wi-Fi is available in the public areas. An indoor swimming pool and sauna room is also featured on-site. Breakfast is served each morning in the Molkerei breakfast room, while guests can enjoy a range of Bavarian specialities in Stubn Restaurant, also located on-site. Freisinger Wochenmarkt is 0.2 miles from this hotel, while Bronzezeit Bayern Museum is about 6 miles away. Campus Cneipe is 10 miles away. Many guests have given compliments to Marriott Munich Airport Hotel regarding the beautiful interior design. The public spaces that become the centre of the hotel gives off a hint of luxury, while the same theme is carried out to the private rooms. If you enjoy contemporary design, you will love what this hotel has to offer. The staff at this hotel are always willing to help you with whatever you need. Whether it's information on the surrounding area or just a wake-up call, they will always get things done swiftly and professionally. 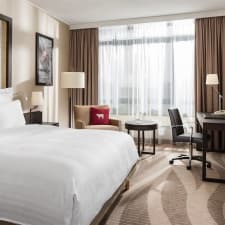 The housekeeping staff at Marriott Munich Airport Hotel work tirelessly to make sure your room is immaculately cleaned before your arrival. They will continue to keep your room in pristine condition throughout your stay. You can count on the housekeeping staff to be thorough in everything they do. Although this hotel offers a shuttle to and from the airport, many guests have complained that this system is not as efficient as they would have hoped. This shuttle system only operates in certain times of the day, and has been known go off schedule. This is something that should not happen, as guests cannot afford to miss their flight. If you are a light sleeper, you might want to bring a pair of earplugs with you. There have been a few complaints that the internal noises during the night can be too much for some. This is due to thin walls that separate each room. There haven't however been any complaints regarding noise from the airplanes. Although most guests had a pleasant stay, there is an additional fee for the use of Wi-Fi in the private rooms. In most guests' opinion, this is something that should be free in this day and age.